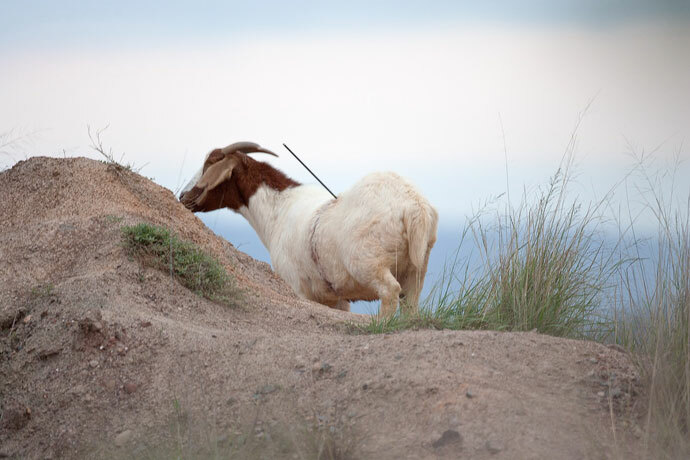 A local resident and WIRES volunteer has been shocked at the inhuman treatment of a pair of wild goats. Akos Lumnitzer, who is an animal enthusiast, walks his dogs along the excavation area at Penrith Lakes along Castlereagh road. Almost 12 months ago he noticed, what he described as, two domestic goats in the area. “I would say they had escaped from a farm nearby, because they weren’t scared of me,” Mr Lumnitzer said. Early last week Mr Lumnitzer discovered that one of the goats had been shot by an arrow on it’s left side. “A lady who lives in the area made me aware of the barbaric shooting of one with an arrow,” he said. After seeing the injured animal Mr Lumnitzer raised an online animal complaint with the RSPCA. They visited the area the next day but unfortunately both of the goats were euthanized. “I think as a local this sort of behaviour is quite disgusting as the animals were minding their own business and a bunch of morons thought it would be a good idea to use them as target practice,” he said.